Each spring, about this time, I start thinking about adding a plant or 2 to my landscape. I step right back into my past life, when I was gardening full time, and remember how excited I’d get considering the possibilities. I haven’t always made the right choices… too tender, too big, too small but, you can’t make mistakes with plants. They’ll forgive almost anything. Last spring, I added what might be the perfect little flowering shrub. It filled out so nicely this year, I found another variety and added it too. 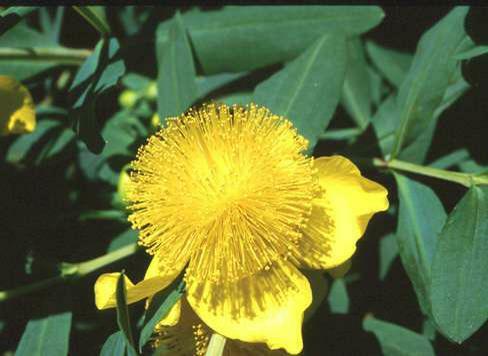 Hypericum, or St. John’s wort, is a small, dense, upright, mounded deciduous shrub that is a star for its large showy golden yellow flowers and attractive blue-green leaves. It grows to 3-4’ tall and as wide. It blooms in June and July and it’s flowers give way to reddish-brown fruit that ripen in September and persist into winter. It grows well in sun or part shade and will tolerate some dryer conditions. You’ll need to shop for this charming shrub at a local nursery… the hardware store will typically not carry it.